With rising sea levels threatening coastal wetlands across the globe, scientists say a greater monitoring effort is needed to prioritize conservation efforts of these important but imperiled ecosystems. The salt marshes and mangrove forests that partially line coasts of every continent but Antarctica provide fish with habitat and people with protection from storm surges. But many are also at risk of being completely inundated by rising seas, which could wipe out 20 percent of coastal wetlands by the 2080s, according to recent models. One challenge to understanding the threat of sea levels to any particular region’s coastal wetlands is that their fate isn’t just a matter of how high the water rises. These ecosystems are characteristically the result of ongoing land-building processes that can affect the elevation of the mudflats where the plants take root. 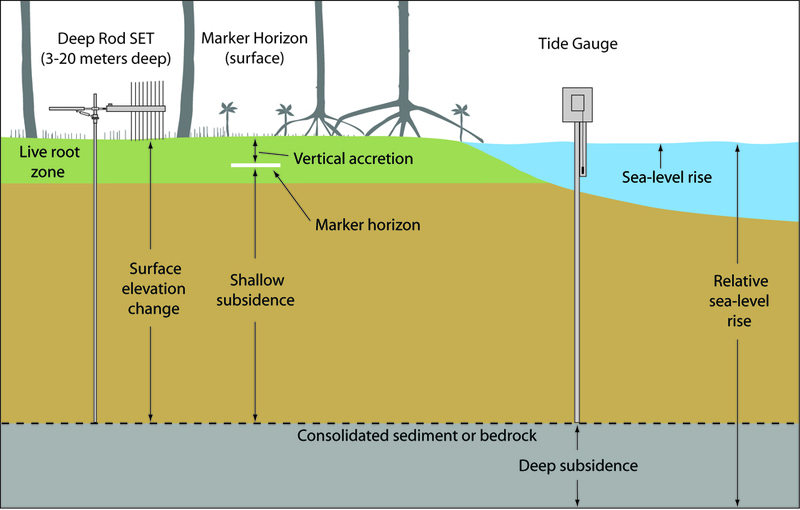 Sediment deposition, root growth, and other subsurface processes may expand the soil, helping the level of the mudflat keep up with sea level rise. But the question is difficult to answer because changes in coastal wetland surface elevation haven’t been well measured at the scale necessary to assess which locations are the most vulnerable. Webb is the lead author of a paper recently published in the journal Nature Climate Change that lays out a plan for fixing that. The plan relies on a relatively inexpensive yet highly accurate method for measuring surface elevation changes in wetlands. It’s called rod surface elevation table marker horizon, or RSET for short. An RSET station starts with a rod driven into the wetland until it hits the bedrock or some similar point of resistance and is encased in a cement sleeve. The rod never moves, giving a permanent benchmark for elevation measurements. The measurements themselves are made with a portable horizontal arm that’s clipped onto the rod and supports several vertical pins. The pins rest upright on the surface of the mudflat and give a measurement of the distance between the surface and the top of the rod. 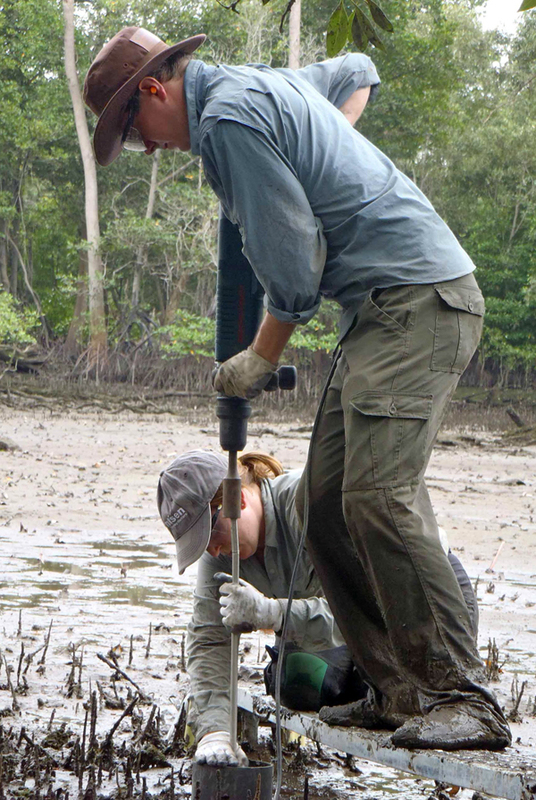 Webb said five years of measurements collected every three to six months from around 32 RSET stations set up in transects across a mudflat will produce statistically robust trends of whether the mudflat is going up or going down. Another element, called the marker horizon, gives an indication of sediment deposition or erosion. Feldspar or white brick dust is applied to the ground. If the marker is buried when scientists return, they can measure the depth to find out how much sediment came in. By comparing those trends with measurements of sea level rise from a nearby tidal gauge, scientists can begin to make assumptions about the fate of a mudflat. Though scientists have been using the RSET method for decades, the applications are often designed to answer specific questions at a single location. What’s needed now is a set of regional networks across the globe, Webb said. Data from those networks would go beyond just assessing the vulnerability of the specific wetland they’re measuring. It would also feed into a new set of computer models that would help predict the vulnerability of regions without measurement networks. Current models don’t account for the land-building processes that can be recorded by the RSET method, leaving a wide gap in our ability to project which coastal wetlands are likely to fall behind rising sea levels. There are examples of progress, Webb said. Surface elevation monitoring networks are in place on Louisiana’s Gulf Coast and in Southeast Australia. The U.S. Geological Survey is working to expand networks in China and Vietnam. But that’s a far cry from what scientists and managers need to predict which coastal wetlands are worthy of climate change adaptation or mitigation investments.